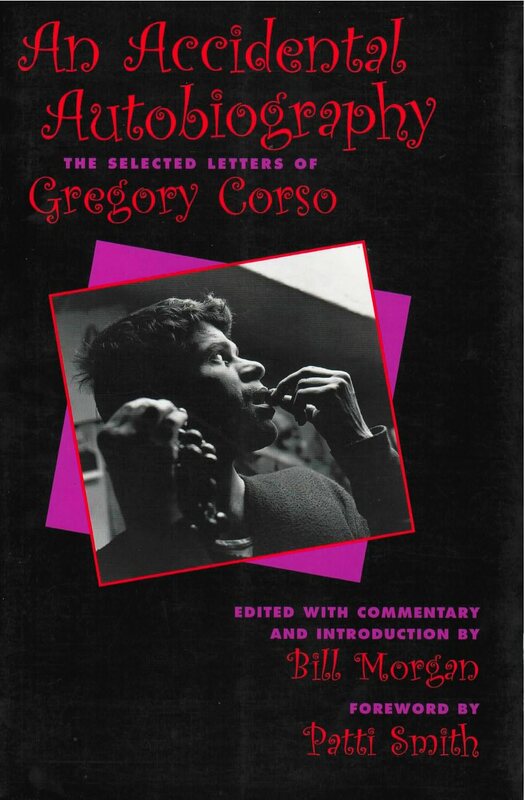 For all his charm and intelligence poet Gregory Corso lived a vagabond life. He never held down a regular job. Until his final years, he rarely stayed very long under the same roof. He spent long stretches––some as long as four or five years––abroad. Many of his letters came from Europe––France, England, Germany, Italy, Sweden, Greece––as he kept in touch with his circle of friends––among them his best friends Allen Ginsberg and Lawrence Ferlinghetti. He left (or was left by) a number of girlfriends and he gathered five children along the way. He was apt to raise a bit of a ruckus at poetry readings and other public events. No one could be sure what he might do next except that he would write poetry and get it published and that it would be widely read. When the idea of a book of selected letters was first proposed, Gregory had some reservations about it. Would the book reveal too much about his private life? But then with typical hubris he said the equivalent of “let it all hang out” and “all” does hang out in An Accidental Autobiography. The book is indeed the next thing to an unplanned self-portrait and gives a lively sense of the life Gregory Corso led, marching to his own drummer and leaving in his wake such marvelous books of Beat poetry as The Happy Birthday of Death, Elegiac Feelings American, Long Live Man, and Herald of the Autochthonic Spirit.